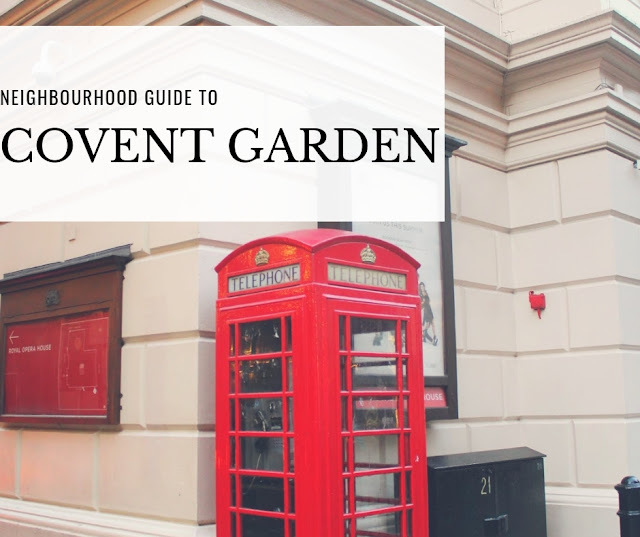 In collaboration with Hotels.com, I have prepared a London neighbourhood guide, focusing on Covent Garden this time. Covent Garden is located in the West London and is known for the market piazza, theatre and entertainment area. Tourists and locals are hanging our around during the day time and night time to enjoy what London center can offer. Home to many fashion stores, boutiques, Apple Market, Royal Opera House and museums. The Covent Garden district is divided by main Long Acre street, Neal's Yard and Seven Dials and the Piazza itself. Did you knew that Covent Garden is the only district in London to have a license for street performers and entertainers? Hence that's why you will see many usual and unusual performers around here. The Covent Garden is served by Picadilly line. Moreover, if you are around Charring cross or Leicester, is it about 10 minute walk to get to Covent Garden. In fact, the shortest tube journey is from Leicester Square to Covent Garden. Taking an account the time getting into the tube and up, it may be even faster to take a walk. Alternatively, Covent Garden is surrounded by numerous buses. 1. Covent Garden Market and Apple Market Once home to the world-famous fruit and vegetable market, Covent Garden continues the vision by offering the audience with unique handmade crafts, independent and franchise shops, pop-ups and more. 2. Neal's Yard Colourful hideaway from a busy streets. Neal's Yard is known for bold coloured houses, Neal's Yard remedies and a cute court yard for dining and drinks. 3. St. Paul's church Parish church located just on Covent Garden piazza is designed in 1631 by Inigo Jones. The church got a nickname of "the actor's church" by a long association with a theatre community. 4. Freemason's hall Freemason's hall is a headquarters of the United Grand Lodge of England and the Supreme Grand Chapter of Royal Arch Masons of England, up until now it has preserved classic Art Deco style. Parts of the building is now open to the public and events. 5. Royal Opera House A major opera house showcasing majestic performing arts is a home for The Royal Opera and The Royal Ballet. 6. London Transport Museum Explore the London Transport Museum for transport heritage of Britain's capital. The museum covers all kind of London Transport, including Transport for London (TfL) which was established in 200. This museum is a parent institution, they have another branch in Acton. 7. Watch theatre plays Within easy walk-able distance from Covent Garden, you'll find yourself surrounded by many theatres where they play worldwide known plays to smaller ones. This are is a huge theatre and entertainment district. To fully experience London, you should get to see a play! The best way to get the best deals, check numerous sites for comparison, such as Ticket Master, Time Out or its official websites. 8. The Neal's Yard Water Clock Just around the corner of Neal's Yard, look up and don't miss the water clock. Running hour by hour, as the water rose in a tank, green man will water the flowers, making them to rise. And occasionally, drop the water down to passengers passing by. 9. The secret comedy club Looking for more things to do? How about spending a night laughing out at a secret comedy club. Every evening there is someone showcasing, so book your seats early, because tickets are for free. 10. London film museum Hidden away from the piazza, but not far away, there is London film museum. Opened in 2008, but moved to Covent Graden location in 2012, the musuem is dedicated to British film industry. Covent Garden is a hotspot for shopping unique, mid-range or luxury products, ranging from fashion, beauty, lifestyle, stationery or gifts. Don't limit yourself walking around the main streets, only, try to turn to side streets, as in every corner there is a unique something to explore! Where to go for a drink and eat? 1. Abuelo coffee shop A small cozy coffee shop for quick break. 2. Le Garrick restaurant Classic French restaurant. 5. Canela cafe Portugese cafe bar for speciality cheese, dining and wine. 7. Avobar Newly opened all-avo casual dining, perfect for breakfast and brunches. 8. Champagne + framage Love wine and cheese? 9. Farmstand Healthy, fast dining spot. 10. By Chloe Plant-based fast-food eatery from US. 11. Abeno Too Japanese cuisine restaurant. 12. La goccia Bar and a restaurant located in Petersham Nurseries, specialised in Italian cuisine. 13. L'Atelier De Joel Robuchon 3 floor luxury French restaurant with a terrace. 14. Bathazar boulangerie Artisan modern European brasserie. 15. Shake shack American fast casual burger place. Whether you are looking for an old school English hotel, modern place or aparthotels, check hotels near Covent Garden for a central and pleasant stay, easily walkable to anywhere. Within short walking distance from Covent Garden you can get to Leicester Square, Picadilly Circus, Trafalgar or to Oxford Street.